I’m a big fan of Crucial. I have 2GB of RAM in my MacBook from them. 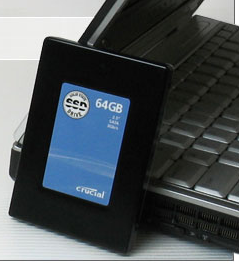 I’m also a big fan of today’s announcement regarding their new SSD for notebooks. The 2.5-inch drive will come in 32GB and 64GB models with a low latency of 1ms. It’s hot swappable and slides into the SATA port or you can get an external kit, SK01, that converts the drive for compatibility via USB. No word on price or date, but they’ll become available some time this quarter.